ECB - Mario Draghi: ECB will engage in "unlimited" bond buying to maintain lower interest rates for troubled EU sovereigns. The Fed plans to buy $40 billion of agency-backed mortgage securities (MBS) monthly, until the labor market improve substantially. The Fed also extended its interest-rate forecast, promising to keep interest rates between 0-0.25% through mid-2015. Before, the Fed had said rates would stay at rock-bottom until at least 2014. On the local front, not exactly a bazooka, we got a few poppers, rather. 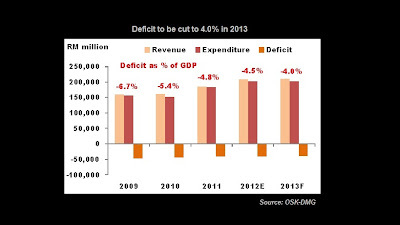 Stronger growth - Government expects stronger economic growth of 4.5%-5.5% for 2013 compared with 4.5% - 5.0% for 2012, while at the same time cutting its budget deficit to 4.0% from 4.5% in 2012. 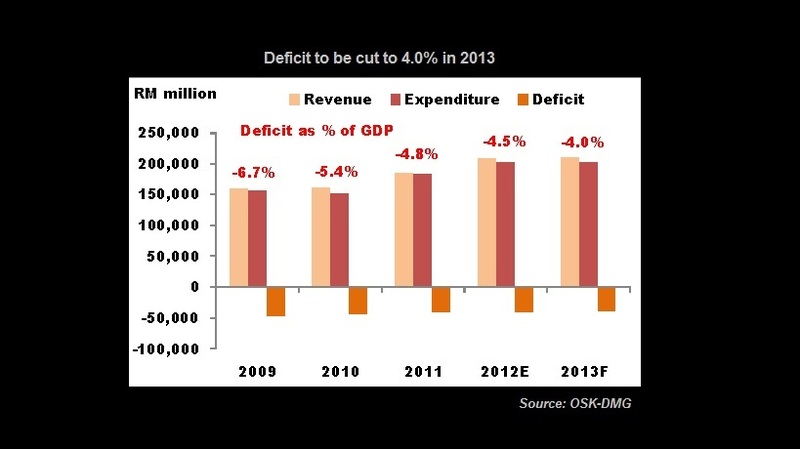 Goodies to the Rakyat - Notable handouts are a 1% cut in income tax, which will give rise to tax savings of up to RM475, a RM250 cash handout under BR1M, a RM100/month raise for pensioners, and special incentives for military personnel worth RM200/month. Though meager, these should collectively boost disposable income & thus spur consumer consumption. Despite all the desperate effort to revive the market confidence, the rally fueled by those various stimulus packages from US & EU was proven short-lived. All the major world indices are currently either back to square one, or worse, lower than where they were before the relief rally. By today's close at 1,620 (Nov 17), we have officially completed the round-the world tour from 1,618--1,678--1,620. We have now tumbled 60pts from the peak of 1,678 to 1,620, within 2-weeks time. Based on fibo projection, I was expecting FKLI to reach 1,700-1750 previously, dragging near the high until we get our GE13 announcement. However, the current correction seems a little 2fast2furious for a healthy pullback. I'm seeing an immediate support around 1,600-1,610 level. If the uptrend is to continue, we should rebound from the 1,600 region, in the last up wave of 5(5)v.
Well, that just send a shiver down my spine because we are either At/Near the END of a Impulse Cycle since recovering from the '97 Financial Crisis (2008 low at 270pts), growing more than 6x within 14 years. 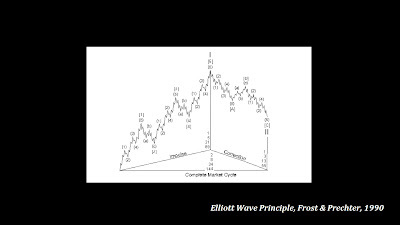 An Impulse Cycle of Wave 1-5 will be followed by a Correction Cycle A-B-C, where correction Wave C usually ends around the low of the impulse Wave 4. 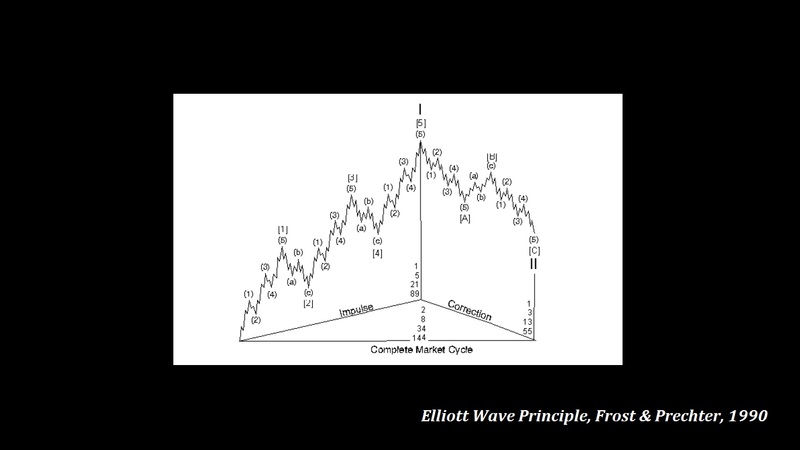 I went on to do a wave count on 15-year FKLI chart. I am not sure if the Primary  is completed at 1,678, or we will have another upleg to a new peak. I shall update it, by end of this month, when we shall know if the current correction is a [A](3)iv or (5)iv. In the mean time, I'll keep an eye on the support level of 1,600. By the way, I just learn up the naming nomenclature for Elliott waves, hope I got it right or some of you can correct me if I'm wrong. Wherever we are at now, we are at/almost-at the END of a cycle, which shall be follow by an ABC correction, of which their projected depth I marked out with arrows in red. As for now, I'm preparing to profit from the plunge, accumulate my capital, & look for opportunities at the bottom. Believe me, anyone who can successfully catch this bottom can easily be the next Warren Buffett 20 years later. Investors should have already taken their money off the table by now, I believe. This is a time to keep cash on hand. While for traders out there, it's our party time!! How low can it go in this plunge? 500? But am wondering what on earth can make our closed market go so far down?